It’s cheap, with SWPL games costing a paltry some of £5. Games take place during the summer and on Sundays. No longer do you have to spend a July afternoon in IKEA, a dead-eyed stare across your face whilst somebody tells you that the Malm bedside cabinet collection is the hottest thing in Swedish design and innovation. Scotland actually tend to win more than they lose. Yes there is a few one-sided drubbings against the likes of Belarus and The Faroe Islands in there but it’s Scotland winning. The majority of the time. I’ll take that any day. If you have one child, and that child is a daughter, then what better way to trick her into getting the football bug than by taking her down to her local women’s football game so that she can find herself some new heroes. The fruit of your loins will play for Scotland after all! It will get you out the house and that can only be a good thing. Surely it can’t be any worse than sitting through Sunderland v West Brom on ‘Super’ Sunday. There’s probably more reasons but I’m going to stop at 5, the season has just finished but the national side have their next home qualifier against FYR Macedonia on Sunday 29th November at St. Mirren Park. So go on, give it a go, you might like it. Anyway with the soapbox tidied away until another day so without much further ado, let’s rate some pie! 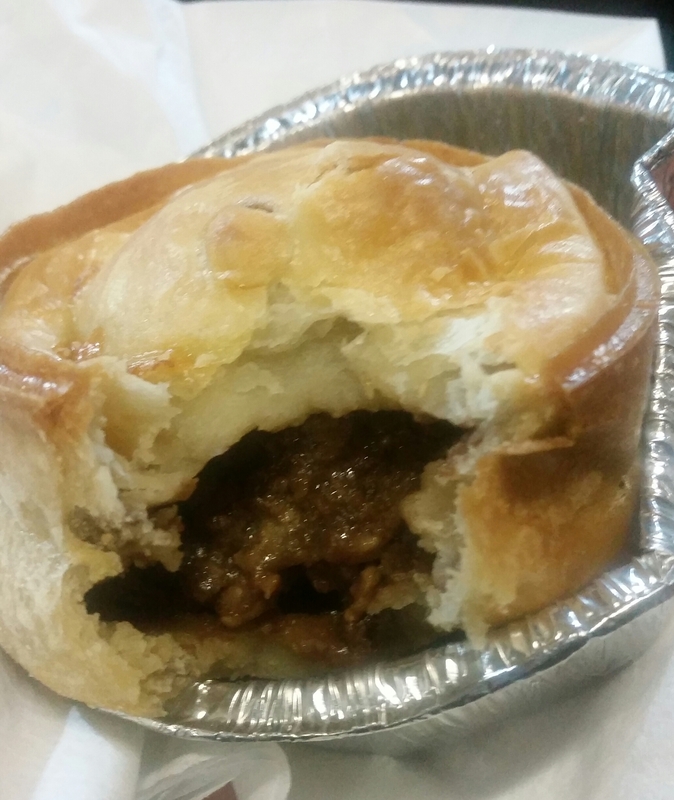 Price: A steak pie is your conventional luxury offering and this one was priced at £2.30, 30p more than the pasta and pastry hybrid available (Pie 107: The Motherwell Macaroni Pie”) from the same venue on the same evening. About average for the level of football normally on show here. Presentation: The staple luxury arrangement of the pie being placed within a tin foil case and on top of a medium-sized white napkin, nothing too fancy here. Meatiness: The meat within this pie was a tantalising mix of small and large chunks of tender steak, soft enough to easily bite through with the odd-shaped meaty bits bursting with a solid steak flavour. The gravy was fairly unctuous, not an absolute topper, but certainly nothing to be sniffy about and overall the whole thing was well proportioned and well seasoned. Pastry: A classic puff pastry top, more dome like than usual suggesting a generous rise had occurred in the oven. The sides were nicely baked and the pastry had not stuck to the bottom of the case, an often found fundamental flaw at Scottish footballs top end pie establishments. Solid effort again. Overall: This was a good pie, with a nice filling and well-baked pastry but as this journey continues to chug along it didn’t feel like it was anything out of the ordinary. Gravy Factor: A premium supermarket brand. Good quality and definitely tasty but not quite at the very top of the game. 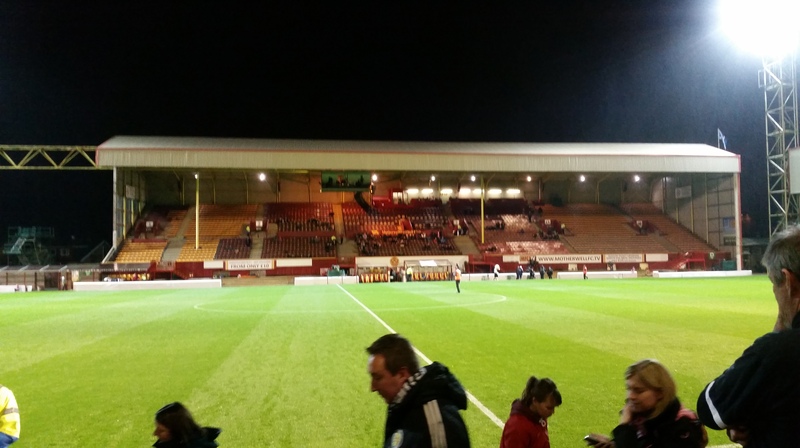 So that’s my Fir Park double dunt done and dusted and I return to my junior roots with a review from Benburb, with a classic scotch pie on offer from New Tinto Park. Until then, go forth and eat pie! This entry was posted in Football Pies, Lady Pies, Luxury Pies, Sporting Pies, The Life of Pie and tagged belarus, Benburb, euro 2017, fitbaw, Football, Gravy, Juniors, Meat, Motherwell, pastry, Pie, scotland, scotland women, steak, tartan army, womens football. Yes that’s right folks we are back with pie number two this week and this time it’s one of the meatiest treats around…The Macaroni Pie! 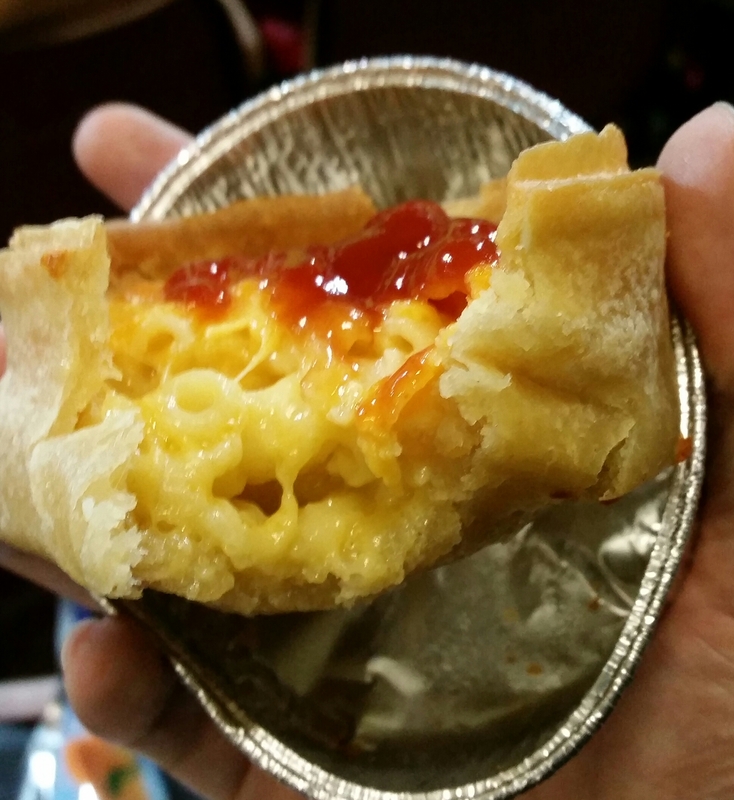 Greggs may have shockingly shunned this Scottish staple but for me a good macaroni pie is a tasty treat to behold. There are bad ones though which can leave your mouth drier than a camel covered in talcum powder. So let’s see how this one works out. Now, I know what you’re thinking, there is no meat in this pie but fear not as back during my review of Pie 57: The Rangers Macaroni Pie I linked cheese and pasta so masterfully to meaty goodness that really this pies eligibility should never be in doubt, so without much further ado, let’s rate some pie! Price: Although entry to a Scottish women’s international is a bargain £5, or free if you are Scotland loving member of the Tartan Army like myself, the games themselves invariably take place in senior Scottish grounds meaning that the price structure to follow is not that of the entry price comparable juniors but that of the Scottish Championship and above. With that in mind a £2 is not bad and a price worth paying considering the endangered nature of these pastries. Presentation: Presented in the now traditional-for-this-level aluminium foil container with a medium-sized white napkin. With the bonus that a container providing heat on a cold night where no hot drinks were available! Meatiness: So let’s move past the obvious first of all. There is no meat in this pie. So what can I look at? Well let’s start with the pasta, perfectly cooked curls of macaroni that were done jsut enough to not be al dente but not so much that they turned to mush. The sauce was really good, often white based sauces can be heavy with flour but this was velvety smooth and smacked you in the mouth with a strong tang of cheesy goodness. 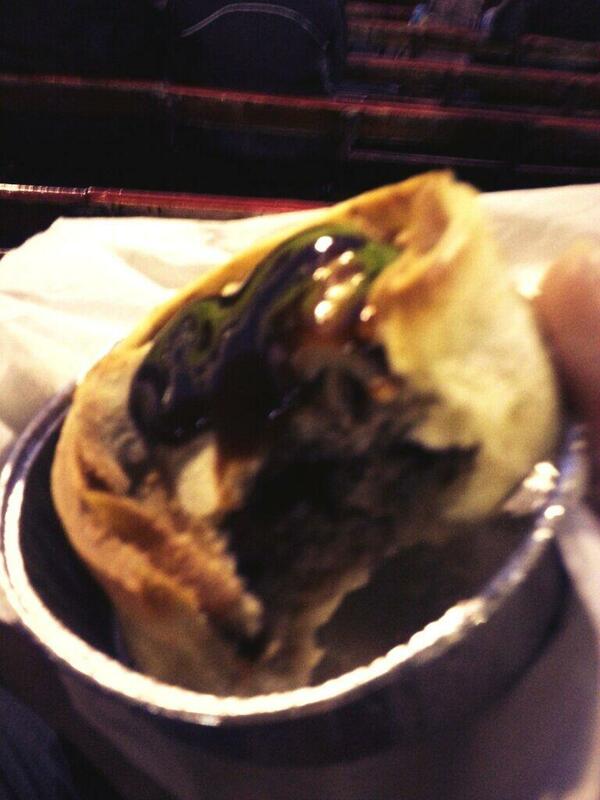 Is it better than a meat pie? Food for thought indeed. Pastry: There is no pastry top on a macaroni pie instead adorning it is a crisp layer of browned cheddar. Delicious! The pastry surround held together extremely well considering the moist filling inside. Brown Sauce: But that’s red sauce! Yes it is red sauce. As a young pup my macaroni cheese would always be garnished with a generous dollop of ketchup so in a nod to the past it’s ketchup for this pie. A wee sachet, just fine. Overall: I liked this a lot and it was a massive improvement on the previous version from Ibrox. The pasta soft, the sauce velvety, smooth and intensely cheesy. Gravy Factor: Fondue. Sometimes it’s good for you and in this case it was! Next time out we have a luxury pie offering from the same game where I will once again make the case for supporting women’s football. 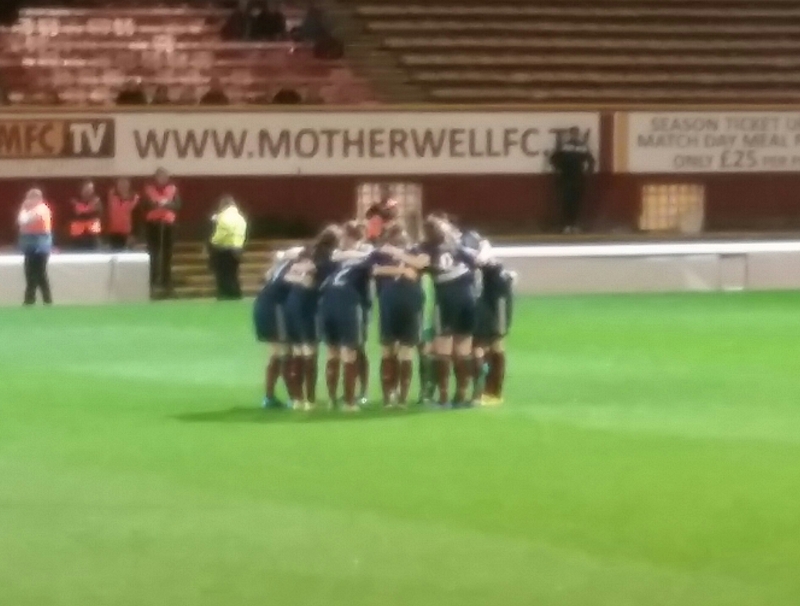 This entry was posted in Football Pies, Lady Pies, Luxury Pies, Professional Pies, Sporting Pies, The Life of Pie and tagged belarus, euro 2017, Football, macaroni, meat filled, Motherwell, pastry, Pie, scotland, scotland women, tartan army, women.